It’s some Flashback Friday nails! I love a good white polish. I think they’re SO elegant. The first time I used Genesis by Zoya, I foolishly believed that it would be opaque in 2 coats. Yeah, 2 coats wasn’t happening. Try more like 5. Five. Coats. So, by the time I did this mani I had learned my lesson. I used Sinful Colors’ Snow Me White as a base and then did 2 coats of the beautiful, shimmering Genesis. Once that was all dry, I got to work with the sparkly stuff! I think rhinestones are my favorite manis to do. 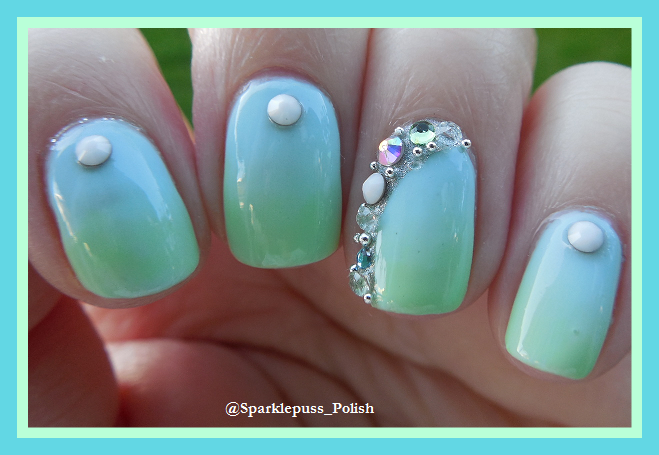 Along with beach nails, which happen to include rhinestones. This may actually be my favorite nails I’ve ever done. It just turned out exactly the way I wanted, better in fact. I’m seriously in love with your rhinestone placement!